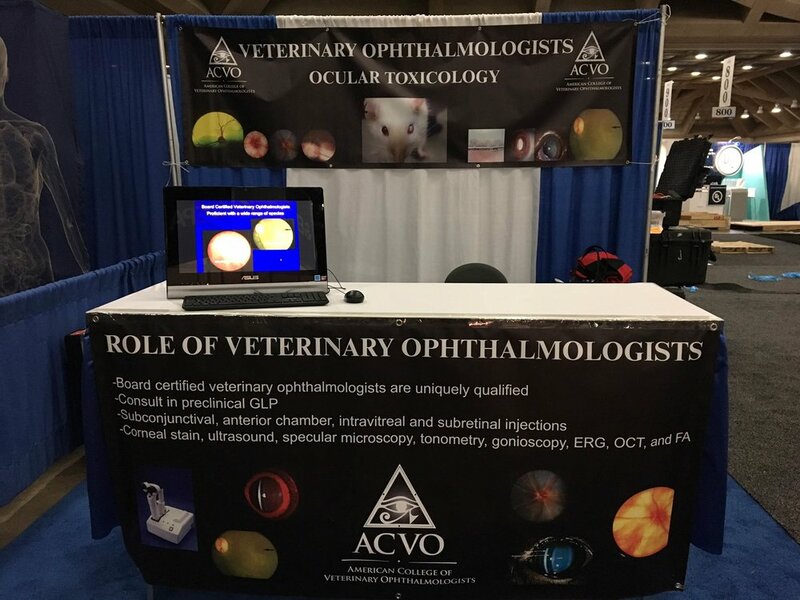 We just completed representing ACVO at the SOT in Baltimore. I want to sincerely thank the following Diplomates who volunteered their time to help me staff the ACVO booth: Dr. Bob Munger (pictured above), Dr. Seth Eaton and Dr. Brian Gilger. "Snowzilla" inhibited Drs. Koch and Bromberg from attending, but I appreciate their willingness to volunteer their time to this effort. We were well received and several SOT Attendees specifically commented on recognizing our booth from previous ToxExpos. We had numerous inquiries about specific expertise ACVO members may offer from different companies and principal investigators including general Tox consulting, lab animal models of disease, in vitro and in vivo project ideas, specialized imaging and all aspects of pathology (processing techniques, lesion identification, and assistance). The ACVO Pharma-Tox brochure was distributed to those interested and all of those with specific queries for help as it directs them to ACVO.org and Stacee Daniel for distribution to the ACVO Pharma-Tox Listserve. Participating in the ToxExpo is beneficial to ACVO as we are increasing our exposure and recognition. In addition, there are potential opportunities being developed for those interested in this industry to gain experience (residents, Diplomates). If you have any questions regarding this information or if you would like to consider attending the 2018 SOT Conference in San Antonio, TX March 11-15, 2018 please let me know.